Toyota will celebrate more than 50 years of its motorsport history at the Goodwood Festival of Speed next week. 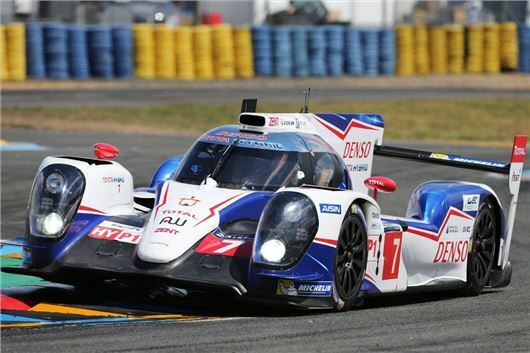 Just two weeks after a hard-fought podium finish at the Le Mans 24 Hours, British driver Anthony Davidson will be driving the TS040, pictured above, on the Goodwood hill climb course on Saturday and Sunday. Alongside the Le Mans car, Toyota's rally heritage will be on display with the famous Group Celica TA65 (pictured below) which will be driven on the rally stage by Björn Waldegård plus there will the the chance to see world champion Didier Auriol in the Tarmac-spec Corolla WRC. On the rally stage, two more competition Celica generations – the ST185, which in its lifetime won three WRC titles, plus and the ST205, will be in action on speed runs. The classic Team Toyota-liveried Midgley Motorsport Corolla AE86 and the earlier Corolla TE27 can also be seen. Meanwhile John Reid will be in his 1997 Corolla WRC, marking the culmination of Toyota’s world rally involvement. Elsewhere, three Nascar-spec Camry and a Hilux, from Michael Waltrip Racing and Red Bull Racing, will be adding some American noise and muscle to the festival. Toyota Motorsport’s EV P002 will be driven up the Goodwood hill by Jochen Krumbach. Krumbach broke the Nurburgring lap record for an electric vehicle with the EV P002 in 2012. The car is powered by two electric motors, giving 350kW and a top speed of 160mph.